The definition of the genus Homo is an important but under-researched topic. 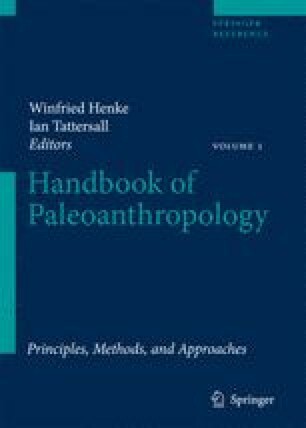 In this chapter, we show that interpretations of Homo have changed greatly over the last 150 years as a result of the incorporation of new fossil species, the discovery of fossil evidence that changed our perceptions of its component species, and reassessments of the functional capabilities of species previously allocated to Homo. We also show that these changes have been made in an ad hoc fashion. Criteria for recognizing fossil specimens of Homo have been outlined on a number of occasions, but these criteria have generally not been explicitly derived from a genus concept. Rather, the course of action followed by most researchers has been to assign new specimens to Homo on the basis of a subset of the diagnostic traits that are considered to be key, and to then redefine the other traits of the genus in the light of the morphological and functional attributes of the new specimens. With a view to moving beyond this approach, in the next section of the chapter we outline six competing proposals for how genera should be defined and consider their impact on the species assigned to the genus Homo. Subsequently, we consider the pros and cons of the six genus concepts. We argue that three of them are impractical and/or internally inconsistent and the other three are useful. We go on to suggest that, while there is little to choose between the latter three concepts on theoretical grounds, the one put forward by Wood and Collard (1999) has practical advantages. In the last part of the chapter, we update Wood and Collard's (1999) review of genus Homo in the light of research published since their study appeared. We find that, on balance, the available evidence still supports their suggestion that Homo should be reconfigured such that it includes H. ergaster, H. erectus, H. heidelbergensis, H. neanderthalensis, and H. sapiens but excludes H. habilis and H. rudolfensis. We also find that the proposed inclusion of the collection of Late Pleistocene specimens from the site of Liang Bua, Flores, in the genus Homo as a new species, H. floresiensis, is not compatible with Wood and Collard's (1999) definition of the genus Homo. We thank Nicole Collard, Alan Cross, Stephen Lycett, and Daniele Serdoz for providing helpful comments on earlier drafts of this chapter.